A great article in The Economist highlights a new UN publication on the balance sheets of countries. Gross Domestic Product measures only flows of wealth, not stocks. As the Economist says: “Gauging an economy by its GDP is like judging a company by its quarterly profits, without ever peeking at its balance-sheet.” The new measure, the Inclusive Wealth Index, looks at three sorts of capital: physical (machinery, buildings, infrastructure); human (education and skills); and natural (land, forests, fossil fuels and minerals). China, the United States, South Africa and Brazil have significantly depleted their natural capital bases. Of the 20 countries measured, only Japan maintained its natural capital base, because it planted more forests. The United States still has the largest wealth, at $117.8 trillion, which is 10 times its GDP in the same year (using 2000 prices). 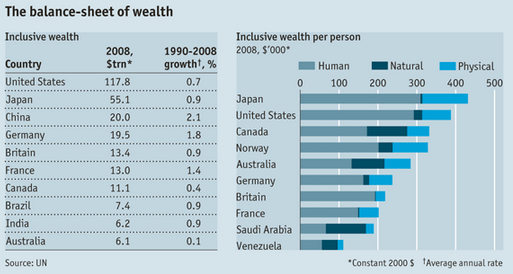 US wealth per person, however, was lower than Japan’s. On a per capita basis, there are some interesting differences to the comparable GDP measure, with big, natural and human resource-rich nations like Canada, Norway and Australia ranking third to fifth. High natural resource wealth also sees Saudi Arabia and Venezuela make the top ten. The list covers only 20 countries, and I suspect that there wouldn’t be enough data to cover many more — which is a problem in itself. But it’s a useful initiative in that it moves beyond GDP, a simplistic and incomplete measure which ignores things like the externalities associated with pollution, or happiness and life satisfaction. It also draws attention away from the relentless growth associated with GDP, which is a problem increasingly recognised not just by environmentalists but by economists. I’m less convinced the implication that everything has a price. As the Economist points out, the exercise makes all three kinds of capital comparable and commensurable, implying that they are substitutable. The Economist points to the example of Saudi Arabia, which used up $37 billion of its fossil fuels in the 18 years until 2008, increasing its stock of human capital by nearly $1 trillion in the form of school-leavers and university graduates. Surely this sort of accounting game is a bit simplistic? Update: Having re-read the final quote i’m not so sure I agree with it as it sounds a bit Malthusian. Nice piece dan. I suspect most of us end up as weak Malthusians in the long run – substitutability hasn’t got that far with core fuels and water, and the end of the demographic transition in rich countries is stagnation or decline not persistent growth as preventive checks get back in place. Thanks. I’m just perpetually in thrall to the transformative powers of technology. Hmmm… Wasn’t that a song by the Smiths?